Providing opportunities for students to succeed was the theme of the Renton Technical College Foundation’s annual fund-raising breakfast, which raised over $101,000 to support scholarships. She presented RTC President Kevin McCarthy with a $10,000 donation to fund scholarships for students in healthcare programs. In accepting the scholarship funds, McCarthy thanked CHI Franciscan for their partnership and for the hundreds of individual donors and companies who help students succeed at RTC through their donations. “Students bring a multitude of strengths and drive to RTC, and scholarships bridge a critical barrier,” McCarthy said. In addition to the CHI Franciscan scholarship, Carrie Shaw, the Foundation’s executive director, announced the new Warren Secord Memorial Scholarship in honor of his 50-year career in the automotive industry. 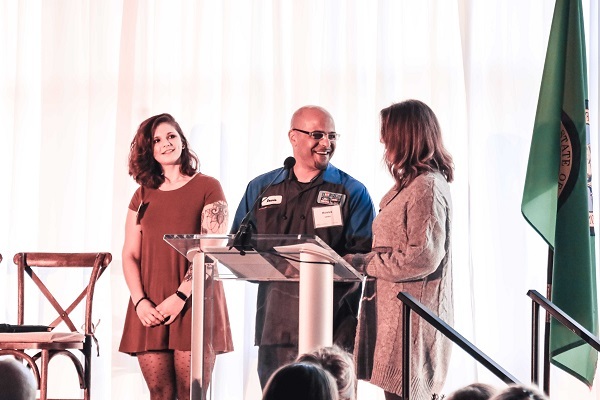 His daughter, Kim Walley, shared the stage with the first scholarship recipient, automotive technician student, Alexis Burton. The scholarship provides $3,000 and covers two quarters of tuition. Other Foundation scholarship recipients, including Anna White and Ronnie Larry, whose stories were featured in videos at the event, thanked generous donors who support their academic and career endeavors. The Foundation Board of Directors also recognized Ellen-Marie Rystrom with the 2019 Lifetime of Giving Award. She endowed a scholarship for automotive students in honor of her late husband, Ron Fahey, in 1997. The fund has grown to over $136,000 due to her faithful giving, and 40 Fahey Scholars have benefited from her generosity through valuable scholarships. In another part of the program, Emcee Meeghan Black facilitated a panel between Lee Fritz, Boeing Skills Captain, and RTC Mechatronics student and Navy veteran, Michael Greer. Fritz shared that RTC is helping to fill the current skills gap that exists in the workforce. Programs that train and prepare students for careers in aerospace, advanced manufacturing, and mechatronics, which combines industrial automation and robotics, are high-demand areas of the state’s economy. “We’re going to have 300,000 manufacturing jobs to fill in the next decade,” Fritz said. Event Gold sponsor Urban Renaissance Group’s Renee Evans echoed that sentiment. “In the ever-evolving technological workforce, appropriately celebrating those who are willing to learn the high-demand trades is the simplest and greatest way to build the talent pipeline,” said Evans, director of Human Resources and Organizational Leadership. Republic Services also served as a Gold Sponsor. Silver sponsors included Associated Builders and Contractors of Western Washington, Boeing, First Financial Northwest Bank, IAM-AW District Lodge 751, Jackson Main Architecture, Judd & Black, King and Bunnys Appliances, Renton Housing Authority, and RTC Associated Student Government. Scholarship recipients Anna White and Ronnie Larry talk with RTC Foundation Board member Reba Haas, vice president for membership.